Great meal tonight, a mustard-coated pork chop with our favorite orzo pasta and arugula salad, and featuring brussel sprouts as our vegetable. The sprouts were slow cooked in a pan with butter, holdovers from our Thanksgiving, and perfect for popping as we talked about the day’s challenges, and still delicious when we ate them with our dinner and the 2012 Josh Cellars Cab. 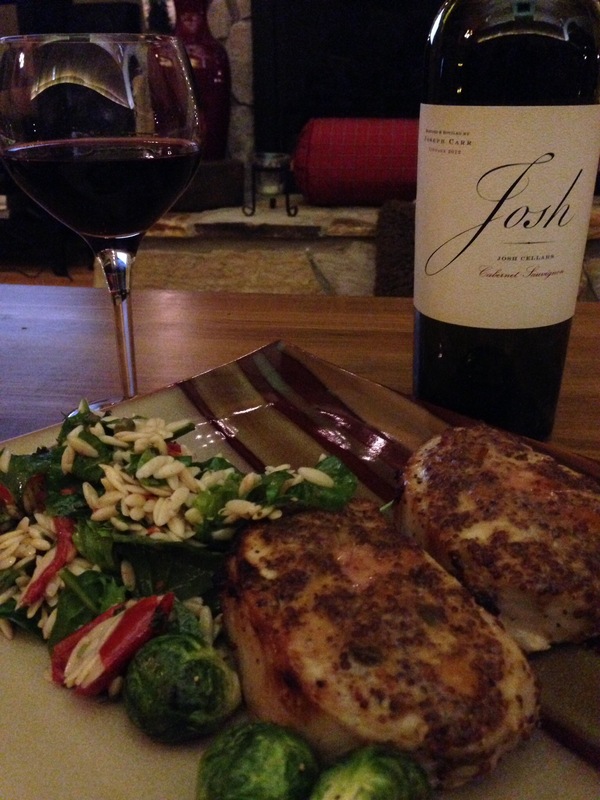 2012 Josh Cellars Cabernet Sauvignon, California, USA. Judging by the “Josh” story I’m pretty sure I’ve had the Josh Cellar experience at least once previously. That time it was the 2011 Merlot; this time it was an enjoyable Cabernet Sauvignon with a warm, home-cooked meal. There’s some smoke in the works here, some spice–a couple of my favorite accents–and an enticing interplay of dusky fruits and berries. It’s a work night, however, so less time to ramble on here about the effect of the Josh or the meal itself. Suffice it to say we’re full, heart healthy here for tonight, and looking forward to the weekend and fun guests. This entry was posted in Cabernet Sauvignon and tagged California, california winemaking, Napa, USA.